August has been a crazy month, lots of life changes and different things happening, so my monthly favourites are a little bit out of the ordinary! Two huge things happened that changed my life. I blogged about them both so I'm not going to go into too much detail, but I have to mention them because they are total faves! I had Botox for my chronic headaches and migraines. I cannot get over how much it has improved my life. I can tie my hair up, wash it whenever I like, I'm not in pain. It's absolutely incredible and I couldn't be happier! We welcomed the gorgeous Sinbad into our lives. 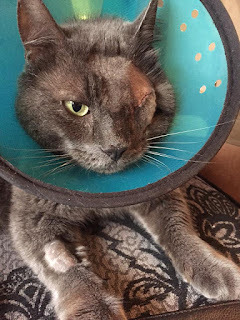 Since I posted about Sinbad, he has unfortunately had to have his eye removed due to increased inter ocular pressure in it, but he is the happiest and fussiest little man, and has been such a trooper throughout everything. His vet totally fell in love with him and said that he's the best cat he's ever met. Chuffed furbaby Momma right here! I already can't remember what it was like without him. He sleeps with us, sits with us, and is generally supervises us around the house no matter what we are doing. He sits on the bathmat when I have a shower even haha! What a cutie. So those are the two biggies, now onto the more materialist stuff! This is one of the cutest pieces I have ever owned, and perfect for the summer-autumn transition. The way it falls is lovely, and the print is adorable. PunkyPins shared a photo of this on their facebook as a few samples for sale and I snapped one up. I adore butterflies, and the pastel colours are just so pretty. It ended up proving so popular they put it into their shop. I can see why! I've been eyeing this top up for ages, and I just had to order it in the end to stop tormenting myself. And boy am I glad I did. I'm not blessed in the boobie department like most plus size ladies, and this top with a plunge bra really makes the best of what I've got! I snapped this up as an ex-photoshoot piece on Sugar & Vice's Depop after falling head over heels for it when it was first released. We were meant to be together. Creepy cute and glittery. Love. I love this purple! It's totally different from anything I would usually wear, and it makes me feel like an alien princess. For a $1, it's a bargain. The staying power isn't amazing, but who cares with such a fab colour. The purple colour in this is possibly my favourite purple I've ever had. And the staying power is brilliant! It lasts all day and doesn't shift, bloody brilliant. I seriously recommend checking out ShopMissA where I ordered the KleanColour makeup from! I also had a totally amazing adventure to London to meet a bunch of babes and get tattooed... but that's a whole other blog post to come very soon! I've been saving up for a large tattoo session, so that's it for this month! What were your favourites? And would you like to see more photos of the animals? Cause I can always share more! *this item was gifted for review purposes, but all opinions presented about it are entirely my own.